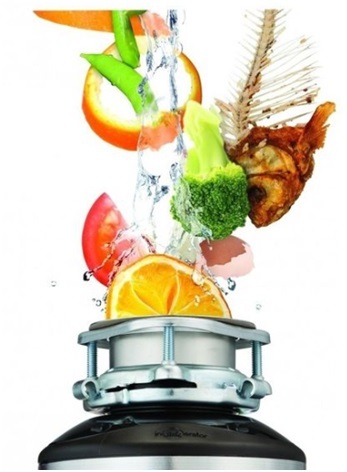 You will benefit immensely from having a home garbage disposal. These are considered both an appliance and a tool for your kitchen. When you have bits and pieces of food after dinner, simply scrape them into the sink side with your best rated garbage disposal and be done with it. Go green when you use it keeping garbage out of landfills. If you garden, use the food scraps in your compost bin. Without a way to dispose of your food waste, your trash can under the sink will smell and can attract mice, gnats, fruit flies, and other insects such as roaches. Grinding your waste will also keep raccoons (left) out of your trash cans and keep bears (right) from rooting around if you live in mountain areas. Bears, raccoons, squirrels, chipmunks, skunks, rats, mice, deer, possums, groundhogs, snakes, armadillos, rabbits, dogs, cats, ants, bees, flies and maggots all carry disease that can reach you. When your water supply and sewage system is hooked up to your city’s system, the food that is pulverized, shown in graphic on left, is flushed with the cold water into those sewage pipes to be treated at the city’s wastewater treatment plant. Never put pills or prescriptions down the disposal, sink, or toilet to be recirculated into everyone’s drinking water. The plant cannot filter it all out! 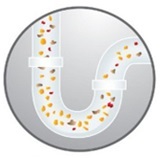 Never put grease down your garbage disposal that will clog your pipes and clog sewer pipes as well. Never pour grease down any drain or the toilet because all appliances that use water use the same drain pipe from your house to the city’s sewer pipe. 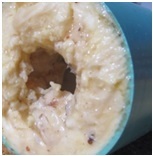 Dump grease into a can then wrap in a plastic bag when it gets hard, and put it into your outgoing trash. If there are only one to two people in your home, you can get by with a 1/3- to 1/2-HP (horsepower) motor because you will probably only use it a few times each week. If, on the other hand, you have a large family or do lots of entertaining, you will want to consider a 3/4- to 1-HP motor for more use. A 1-1/4-HP motor is extremely powerful for professional use and homes with many people. Apartment buildings can usually get by with 1/3- to 1/2-HP garbage disposals. 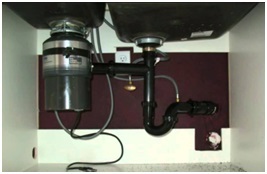 You will want to consider the space under your sink since this is where the disposal will be installed. If you have a dishwasher, its water outlet pipe is plumbed into the disposal to be plumbed into the drain pipe. Larger HP disposals will take up more space, so be sure to measure the height under the sink or have a plumber do it for you using the dimensions on the disposal you plan to buy and install. The best rated garbage disposals are about $200 but you can buy units for as low as $100 and under. When you buy a cheap garbage disposal, you generally sacrifice two things being horsepower and build quality. The best quality garbage disposals can cost up to $300+ with Lifetime Warranties. My garbage disposal reviews list those that can be used with septic systems. All the ones listed are continuous-feed meaning you don’t have to turn the power switch off, put more food waste inside, then turn the power on again. Batch fed units are another type, more inconvenient to use, and are not reviewed or discussed here. Batch-feed disposals activate only once the drain has been covered. These are good when little kids are around for safety. Longer Warranties with more costly units. The #9 InSinkErator® Evolution Excel® Garbage Disposal, 1-HP, model number 76336A discussed below at about $354 today is loved by both home users and professional kitchens. It will chop up steak bones, pineapple tops, avocado skin and pit, watermelon rinds, corncobs, and anything being food waste that you can put into it. It is so quiet you will want to check it to be sure the switch is turned off or the motor will burn up. 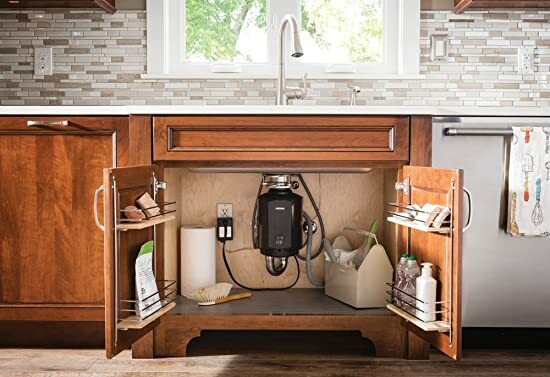 The InSinkErator® Evolution Excel® is easy to install and takes up space under the sink and is a bit heavier than most. It’s durable and reliable with a great Warranty. 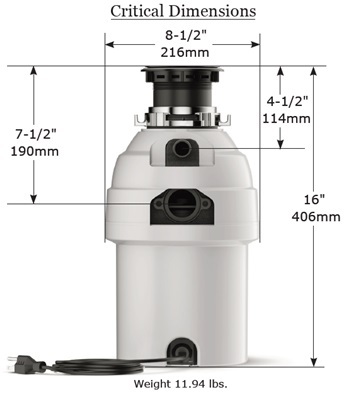 The #2 InSinkErator® Badger™ Household Garbage Disposer, 3/4-HP, model 5XP is a little over $100 for those on a budget, is louder, yet is easy to install and the noise is not an issue. It comes with a 2-year Warranty and will last for years. The best garbage disposals will cost from $200 and up. You can, however, find continuous-feed models for less money such as the #5 KitchenAid® Continuous-Feed Food Waste Disposer, 1/2-HP, model number KCDB250G for under $100. 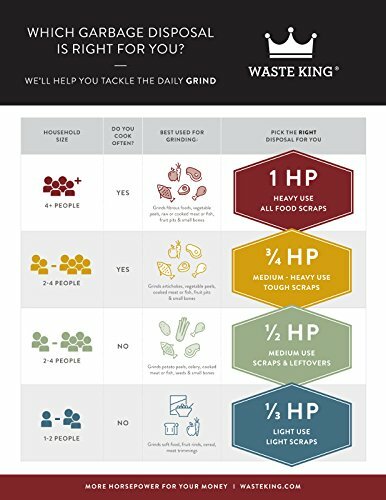 This is for a single person or two-person home when you only grind up food scraps a few times each week. These usually have galvanized steel components rather than the better stainless-steel workings. These are usually 1/3- and 1/2-HP so will not be as powerful to grind up any bones other than those inside fish. It is not as quiet as more costly models, but it’s only going to run for about 30-seconds anyway. The Warranty is short for only 1-year. It’s durable and buyers like it since it grinds well. 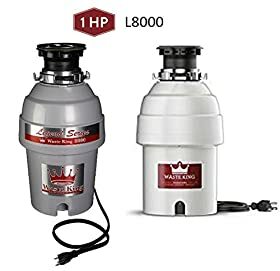 The best disposal for the money is the #10 Waste King® Legend Series Garbage Disposal with Power Cord, 1-HP, model L-8000. 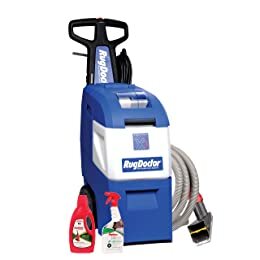 It is the top-rated disposal and the price range is a little over $100. It is super-fast, powerful, and can chop up celery stalks and bones. It has a 20-year Lifetime Warranty and runs better than more expensive disposals. 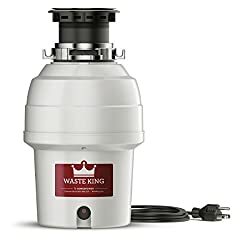 The Waste King® disposals are made by Anaheim Manufacturing and sold under the Waste King®, Moen®, Kenmore®, Frigidaire®, FRANKE, and other brands. Check the Consumer Product Safety Commission website for a full list of brands, model numbers and serial number ranges. You don’t want the serial number that was recalled in 2017 and not sold now. The Waste King® Legend Series model L-3200 EZ-Mount 3/4-HP at 2700 RPM is a permanent magnet motor that is whisper-quiet and jams less than other models. It is a continuous-feed with power cord to be plugged into a receptacle or hardwired. 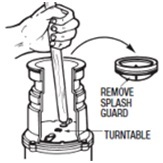 The Waste King® garbage disposal is easy to mount and install with a removable splash guard on top to clean easily. It’s lightweight with stainless-steel grinding components. Turn on the wall switch and it will turn on and run continuously until you turn it off or use a sink-mounted air switch. Plug the 3-prong grounded UL® listed cord into a 110/120, 50/60 Hz receptacle in North America. It also works with septic tank systems. Tools needed for installation: Screwdriver, adjustable pliers, plumbers’ putty, hammer, and dowel/punch. You will receive a User’s Manual for installation instructions, sink flange, drain elbow, mounting assembly, reset button, drain stopper, splash guard, and power cord. You will also receive the 8-year Limited Warranty. It is made in China. Waste King® any model installation video. Waste King® L-3200 Legend Series 3/4-HP Continuous Feed Garbage Disposal with Power Cord installation video. The InSinkErator® Badger™ model 5XP is powerful and a best-selling garbage disposal on Amazon.com®. For over 75-years InSinkErator® has been known for building one of the world’s best food waste disposers. In fact, not only is InSinkErator® the largest manufacturer of disposals for home and commercial use, InSinkErator® invented them in 1927. XP means extra power. The InSinkErator® Badger™ Series garbage disposals are a reliable and functional choice when affordability is the prime concern. 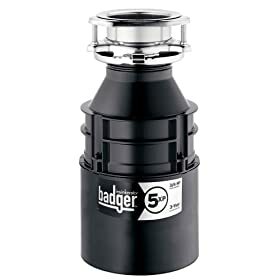 The Badger™ 1 is a 1/3-HP small garbage disposal about $16 cheaper than the 5XP and the Badger™ 5 is a 1/2-HP and about $2 more expensive than the Badger™ 5XP and comes with a power cord for plugging into the receptacle. Only the model Legend Series® 5XP 3/4-HP, 1725 RPM, is reviewed here and does not come with a power cord that you can remove and use from your existing disposal. It has a 26-ounce grind chamber of galvanized steel and induction motor and is continuous-feed. The design is compact and space saving. It is safe to be used with the proper size septic tanks. Plug the 3-prong grounded UL® listed cord into a 110/120, 50/60 Hz receptacle in North America. You will receive a User’s Manual for installation instructions and a 3-year in-home Limited Warranty. It is made in the USA. 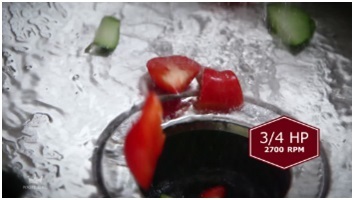 InSinkErator® Badger 5XP® Garbage Disposal video. 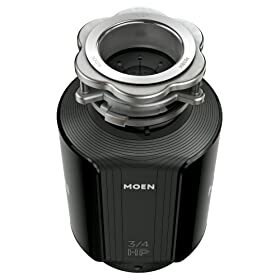 The MOEN® company not only makes sink and bath faucets, spa and shower appliances, they also make the best garbage disposals for home kitchens shown on Amazon.com®. This unit is also available in 1-HP, 1/2-HP, and 1/3-HP for your specific family needs. The MOEN® model number GXS75C, 3/4-HP comes preinstalled with the power cord, has a 2700 RPM VORTEX™ permanent magnet motor that will decrease food jamming. It has a removable splash guard and drains efficiently. The Universal Xpress Mount™ fits MOEN® and most existing 3-bolt mounting assemblies, including InSinkErator® brand. This is a great feature lessening work for you when replacing your garbage disposal. Plug it into an existing receptacle or hardwire if you must. It has the SoundSHIELD™ insulation system designed to provide sound deadening for a quiet slight hum sound. The grinding components are made of galvanized steel with continuous-feed. The sink drain flange is highly polished stainless-steel. The grind chamber is made of corrosion proof polymer and it comes with the drain stopper as do all kitchen garbage disposals. You can use with the proper sized septic tanks. Plug the 3-prong grounded UL® listed cord into a 110/120, 50/60 Hz receptacle in North America. Gift-wrapping is available and you will receive the installation components with a User’s Manual. The disposal comes with a 5-year Limited Warranty with in-home service. It is made in China. Moen® GX Series Waste Disposals video. The Whirlpool® company makes many home appliances to include quiet garbage disposals. 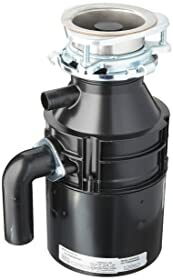 The Whirlpool® garbage disposal, model number GC2000XE sold on Amazon.com® is a continuous-feed 1725 RPM food disposer. It’s also available with a 1/3-HP motor for a single person or small family. Its shredder ring and grinding wheel are made of galvanized steel with stainless-steel swivel impellers. The power cord is included on this model (XE) to be plugged in or hardwired. 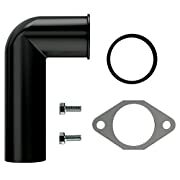 The sink flange is stainless-steel and the entire unit uses the quick mounting system. It has a thermal overload power protector and manual reset. The drain chamber and grinding chamber are ABS (Acrylonitrile Butadiene Styrene) plastic used today in plumbing. Note: on the drain port that your dishwasher feeds into, there is a knockout plug that needs to be removed. It is inside of the port and is not obvious. If you replace your disposal and then your dishwasher won’t drain, you didn’t take the plug out. It does not come with plumber’s putty, so be sure to buy it before you start your installation. Gift-wrapping is available for presenting to your loved ones. It comes with a User’s Manual and a 1-year Full Warranty. It is made in the USA. 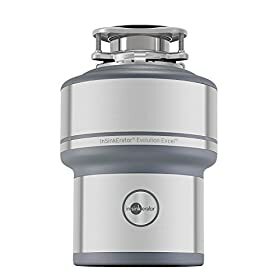 The KitchenAid® garbage disposal KaDette 250, model number KCDB250G (84211643) is a top selling food waste disposer selling as Amazon’s Choice unit on Amazon.com®. This is the best cheap garbage disposal for the money. With a 1725 RPM motor, food grinds up quickly with its continuous-feed. You will receive a User’s Manual for installation instructions and a 1-year in-home Limited Warranty. It is made in the USA. Emerson Electric™ has been making wonderful home and commercial products for years. 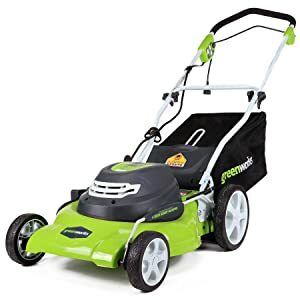 The model E202 sold on Amazon.com® is affordable for medium sized families. Headquartered in Racine, Wisconsin, InSinkErator® is a business unit of Emerson®. If you love InSinkErator® disposals, you’ll love Emerson™ with its 1725 RPM motor. It comes with a splash guard and gasket, but no power cord. The wrench is provided in case of a food jam. 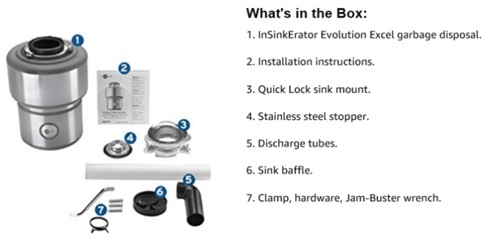 The Quick Lock® is the same system used on InSinkErator® for fast and easy installation. The grinding components are galvanized steel with 2 stainless-steel 360-degree swivel lugs. The baffle is cushioned to not have splash-back. The grind chamber is 26-ounces. The sink flange is made of stainless-steel with a nice positive sealing plastic sink stopper. It also has thermal power overload protection and can be manually reset. Of course, the upper and lower bearings are forever lubricated never needing to be lubricated by you. It comes with a dishwasher drain connection. The power is 840-Watts and 6-Amps. You will receive the Installation Care and User’s Manual with a 1-year parts and in-home service Warranty. It is made in the USA. The American Standard® Company has been making home products for the bathroom and kitchen for over 140-years. The ASD-1250 is an Amazon.com® Choice product that’s affordable for its amazing features. It comes with the power cord and grinds at 2800 RPM with an insulated sound system. What I like is that is has its Silver Guard magnets that catch almost all metal objects such as knives before they go down into the chamber. The splash guard is removable and has Bio® Shield to clean easily and stops bacteria growth that can be smelly. It’s easy to install with its 3-bolt mounting system. The balanced grinding lessens noise and vibration for quietness. It is safe to use with septic systems. Plug the 3-prong grounded UL® listed cord into a 110/120, 50/60 Hz receptacle in North America. It comes with the sink flange, fiber gasket, support flange, upper mounting ring, 3 mounting screws, retainer ring, and cushion ring. You will receive the installation instructions, User’s Manual, and 10-year Warranty. 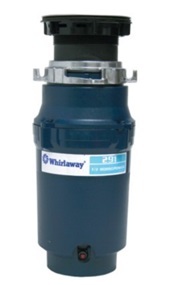 Whirlaway® is made by Waste King® and the model 291 shown on Amazon.com® is durable and reliable for a cheap garbage disposal that does the job with its power of 1/2-HP and 2600 RPM VORTEX™ permanent magnet motor that minimizes jams. With its EZ-mount installation process, you’ll have it in place in no time. The grind components are made of galvanized steel being continuous-feed and the drain flange is stainless-steel with stainless-steel anti-jam swivel impellers. Plug the attached cord into the wall receptacle or hardwire for your needs. It’s a quiet unit but has no sound insulation. It’s compatible with septic tank systems. It hooks up to a dishwasher and remember to remove the knock-out plug or the dishwasher will not drain water. You will receive a User’s Manual for installation instructions, sink flange, drain elbow, mounting assembly, reset button, drain stopper, splash guard, and power cord. You will also receive the 2-year Limited Warranty. It is made in China. 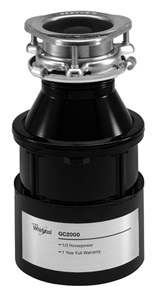 The InSinkErator® Evolution Excel® garbage disposal is the high-end of all waste disposers in the marketplace. 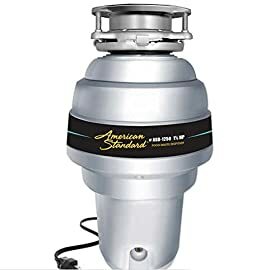 The model number 76336A shown and sold on Amazon.com® is the best of the best disposal and no other meets its quality, durability, and performance being powerful yet more costly that will save you money over your years of use. A disposal with 1-HP provides the power you need in a continuous-feed unit and it is single-phase, as are most. The RPMs are 1725. If you don’t have an existing power cord, you will pay $55 more buying the unit with a power cord. It grinds more holding 40-ounces in its stainless-steel grind chamber. All other components are stainless-steel for durability. 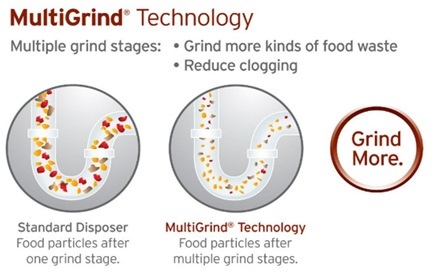 Its MultiGrind® method has 3 stages of grinding for foods most garbage disposals cannot grind. This disposal will not jam and automatically increases torque 500% to break up jams with its special Jam-Sensor® circuit. It also features the auto-reverse function for going backwards to remove jams. 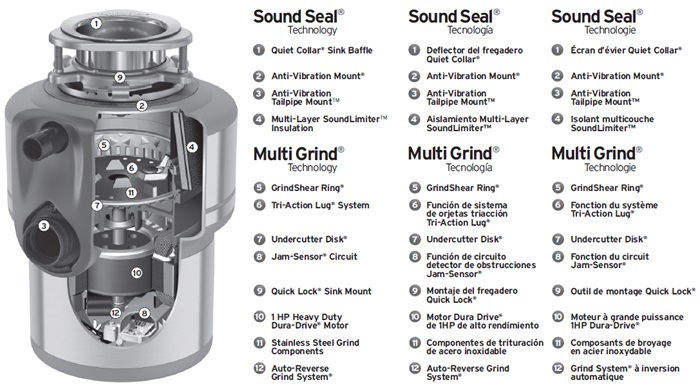 With its SoundSeal® system, it is super quiet so you can think and hear people talk. 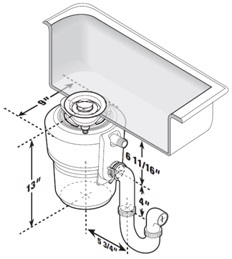 The installation is easy with its Quick Lock® sink mount for a replacement of an old disposer or new system. The motor has thermal overload protection with a reset button. All components are permanently lubricated and the finish is stainless-steel in a light gray color. The energy used is 3-4 kW per hour and approximately 1-gallon of water is used daily. You will receive a User’s Manual for installation instructions and a 7-year We Come to You® In-Home Limited Warranty. It is made in the USA and we love to buy USA-made products! 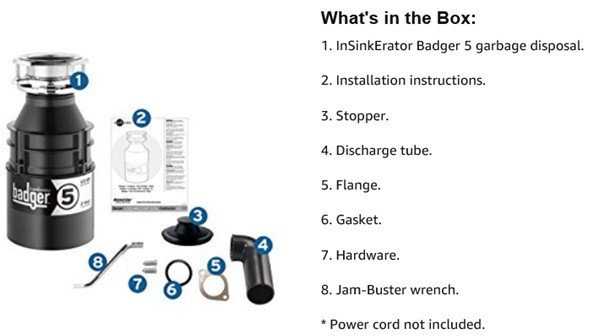 How to Install a Garbage Disposal – InSinkErator® Evolution Excel® video. The Waste King® garbage disposal, model L-8000 EZ-Mount, 1-HP at 2800 RPM is a permanent magnet motor that is ultra quiet and jams are reduced. It is a continuous-feed with power cord to be plugged into a receptacle or hardwired. This is a Choice Amazon.com® disposer and a #1 best seller. With more horsepower (HP), the disposal has the energy to chop up the toughest of food. 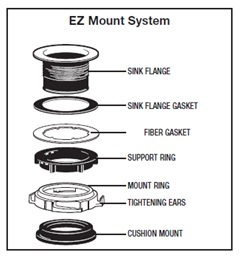 The EZ-Mount uses the twist-and-lock sink flange for very easy installation. Sound reduction is reduced with internal insulation. 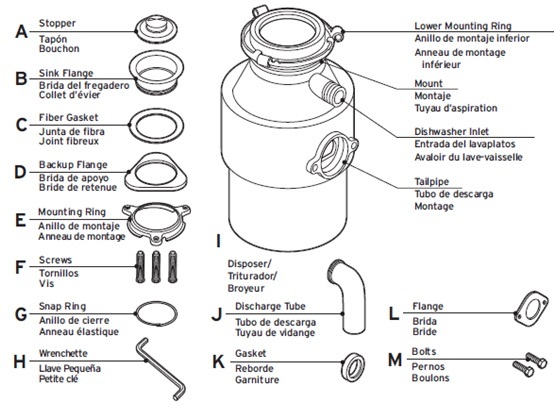 The stainless-steel garbage disposal grinding components prevent rust and deterioration. The grind chamber is reinforced polymer for corrosion resistance and the sink stopped is polymer. Being continuous-feed, you can start the unit using a wall switch or sink-mounted air switch. The splash guard is removable to clean the gunk from the underside and it’s replaceable if it ever tears, which is unusual. It has thermal overload protection and a front reset button. 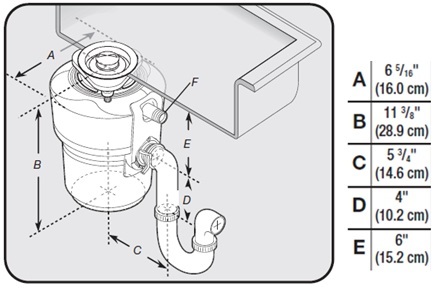 You will receive a User’s Manual for installation instructions, sink flange, drain elbow, EZ-mounting assembly, reset button, drain stopper, splash guard, and preinstalled power cord. You will also receive the huge 20-year In-Home Lifetime Limited Warranty. It is made in China. Customer testimonial for the Waste King® L-8000 video. Installing Waste King® L-8000 Garbage Disposal video. Always read your User’s Manual first to know what not to put down your garbage disposal. If it doesn’t turn, be sure the power is off. Using a flash light and tongs, check inside to see if something is lodged between the blades. If not, remove the splash guard, use a wooden broom handle and turn the blade to the right. You should feel it free up. Remove the broom handle, turn on the water, and turn on the switch. Some foods aren’t safe for your garbage disposal. Starchy or fibrous foods are especially known to clog a garbage disposal. If you can scrape that food into the trash, it’s best that you do. Cut the foods into small pieces. Banana peels can be separated vertically and don’t put the stem end down the disposal—it’s like wood. To clean your garbage disposal, just toss some ice cubes or citrus peelings into it and grind them up. 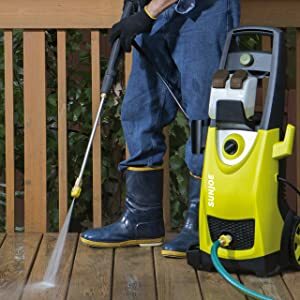 This will help to remove grime stuck to the blades reducing clogs and eliminating the need to call a plumber. Never put oils, fats, lard, butter, or any grease or greasy foods into a garbage disposal or down any drain or the toilet. What Can and Can’t Go Down a Garbage Disposer – This Old House video. Do not put large amounts of food into the disposal at one time. Grind up small chopped up pieces at a time to avoid jamming and blockage. After your food has finished grinding, run hot water to flush your drain pipe for about 20-30 seconds. It’s best not to put coffee grounds or egg shells down a disposal. Both are grainy and can sit in spaces to clog especially older plumbing. It’s easier to just put into the trash and avoid unwanted expensive fixes. How to Repair a Garbage Disposer – This Old House video. Home kitchen disposers or professional kitchen garbage disposals are rigidly made today being efficient, functional, and quiet when running, affordably priced. They will last for years when you use common sense with what you put into it. Always read your instruction booklet for what cannot go into your disposal and how to unjam it, which is seldom when used properly. Leave comments or questions in the box below for a reply to each one of you. Happy shopping!